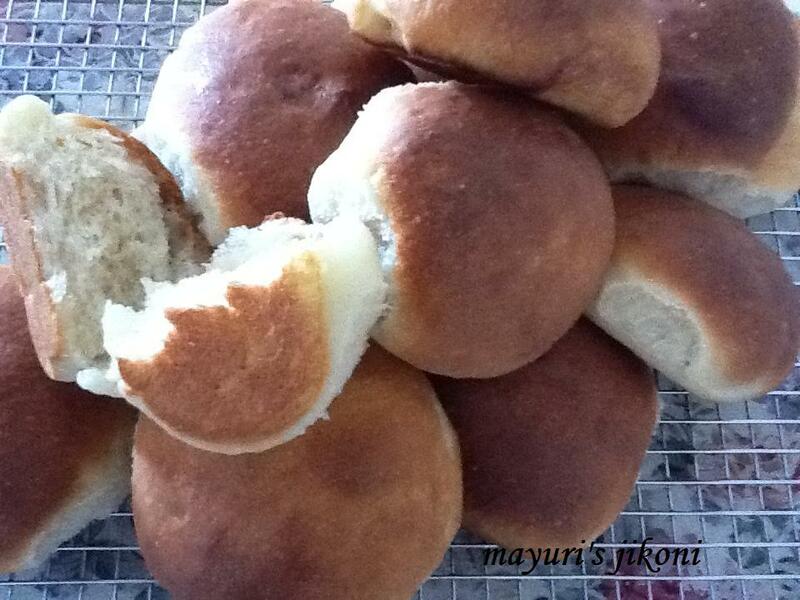 Pav or ladi pav is nothing but the Indian name for white bread rolls. These roll are not exactly round, they appear a bit squarish and therefore the name ladi, meaning slab. Pav is used widely in most homes and by fast food outlets. Its used for the pav bhaji, vada pav, egg buns, or served with any curry etc. I love toasting the pav with a dollop of butter or ghee on a pan or tawa and having it with hot masala tea. The bun is toasted with the cut side on the pan,till it is slightly brown and crispy. So you have a soft top but a crunchy bottom. Yummy. Most ready pavs sold in India are sickly sweet. I have reduced the amount of sugar. These rolls are slightly different from the basic white dinner rolls because it has more butter in it. Therefore you get a nice buttery and slightly salty taste. They turn out very soft and it’s an ideal sort of bread to wipe the curry off your plate! I didn’t have a smaller tray and the one I used was too big to place 12 buns. The buns turned out well but do not appear slab like at all. However, I decided to blog the recipe anyway because the rolls turned out really good and don’t even ask me about the smell of fresh bread baking. Heavenly! As soon as the buns were ready, Ajay suddenly felt a hunger pang for coffee. I made the coffee for him and realised the whole reason he wanted coffee was to dunk the hot buns into it. If you are using dry active yeast which is not instant then you need to ferment the yeast first. Take about ¼ cup of warm milk, add a bit of sugar and sprinkle the yeast over it. Cover it and place the mixture in a warm place for 10 minutes. After 10 minutes the mixture will become frothy. Add flour, salt and sugar and mix the flour. Add the instant dry active yeast or the frothy mixture and milk. Mix it up using a spatula. Leave the dough covered for 5 minutes. Dust a work top or a large tray with quarter of the flour. Knead the dough for nearly 10 or 15 minutes using the heel of your palm. Keep on greasing you hands with the measured butter if the dough becomes too sticky. By 15 minutes you should have used up the measured butter. The dough should be soft and silky. Grease a bowl lightly with extra butter. Rub little bit of butter over the kneaded dough. Place the dough into the greased bowl. Cover it with a cling or plastic sheet and place it in a warm place till the dough becomes double the size. Mine took 2 hours. Dust the worktop with flour and gently roll out the dough into a thick rectangle or square (about 1 inch thickness). Cut the dough into 12 equal pieces. You should have 12 squares. Grease a square, rectangle or round baking tray lightly with butter. Take a square piece and shape it into a round ball. Place the ball in the greased tray. Repeat with the remaining squares.Place the balls in the tray, leaving about one inch space between the rolls. Cover the tray and place it in a warm place for the rolls to rise till they are double the size. Mine took about an hour. Preheat the oven to 200°C. Brush the tops with milk. Place the tray into the hot oven and bake the rolls for 15 minutes. After 15 minutes reduce the heat to 180°C and bake further for 5 minutes. Remove the tray from the oven. Leave the buns in the tray for 2 to 3 minutes. Remove the buns and place it on a wire rack to cool down completely. If you are not going to use the buns immediately, store them in an airtight container to keep them soft. Add minced garlic, or a tsp of cumin seeds into the dough for flavoured buns. Make them into tiny buns for your kids lunch box or to serve mini pav vadas as a starter. Add more flour if the dough is too sticky to knead. However make sure the dough is not too hard. It should be soft. Use a kneading machine if you have one. Resting the dough for 5 minutes after adding the ingredients, helps the gluten to start working and the dough becomes easier to knead.